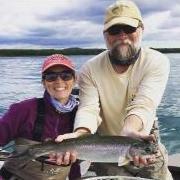 Considering all things, I don't think you can ask for better fishing conditions on our lake this fall. 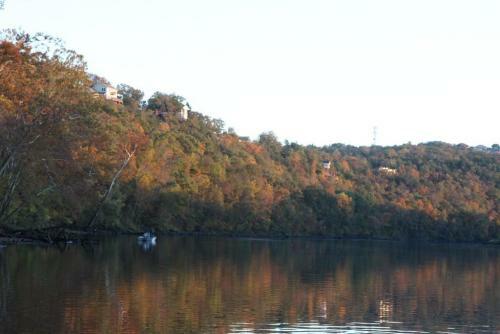 Lake Taneycomo, a tail water, is subject to low oxygen conditions because it is a tailwater. We get our water from the depths of Table Rock Lake where the dissolved oxygen bottoms out this time of year. But when the water is run through Table Rock Dam, the U.S. Army Corps of Engineers adds liquid oxygen to the water in the turbines, bringing the oxygen levels up to fish-livable levels. But in our present case, our lake water continues to register at high levels of oxygen. Just today we measured 8.0 parts per million -- which is incredibly high. Our water temperature remains low, which is also helpful, at 53 degrees. The other thing to consider is generation. For fly fishermen who like to wade and fish below the dam, this fall season has given them just what they love - low water conditions. They've been seeing many trophy browns - and rainbows - and they've been hooking a few of them. My friend and fellow fly shop owner, Tim Homesley, drives over from Crane and his home water, Roaring River, and fishes our tailwater several times in the fall season. He likes to fish the "skinny water," which is my favorite, too. Rainbows especially hug the banks with their backs out of the water sometimes, digging in the gravel to pick up a bug or two. Casting a small sow bug or scud, even a big mop worm or mega worm, and working it in and around these feeding rainbows will catch them. 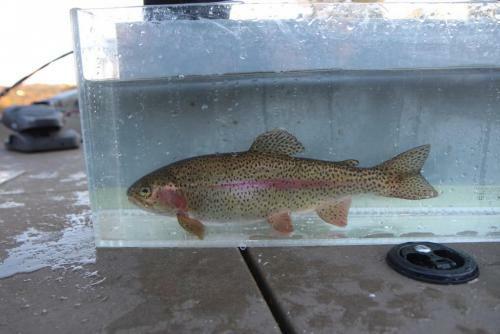 These trout are typically veterans, too, full of colors and larger than the young stockers just arriving on the scene. In the past, I know anglers have scored big browns and rainbows stripping soft hackles and cracklebacks well below the hatchery outlets and below Rebar and the Chute (below the Missouri Department of Conservation boat ramp) where the current is still moving from the area but is slower, not calm. If there is a breeze and a chop on the surface -- better yet. And then there's the streamers like sculpins, Hybernators, leaches, woolly buggers and Pine Squirrels. Strip these in the bigger, deeper pools out in front of outlet #1, the pool below outlet #2 and from the Rocking Chair down to the Chute. Is it time to go to 7x tippet? Maybe. I did for a little bit last month, but our water seems to have some color to it now, so I've gone back to 6x fluorocarbon, and it's worked pretty well. With the leaves dropping pretty fast now, we're starting to fish the Zebra Midge under a small float 12 inches deep and targeting midging trout around the leaf clusters on the lake. There's something about these leaves that attracts fish -- whether there's bugs on the falling leaves or midges that attach themselves to the leaves before flying off. We're doing this about any place on the lake right now, especially towards evening time. I've been fishing with a scud (fly) a lot this week and doing very well! So much so that I videoed some of my fishing and posted it to show exactly what and how I was catching rainbows. We've been throwing 1/32nd-ounce jigs with two-pound line and catching some good fish around the dock and up lake around Short Creek. Sculpin/ginger or brown/orange with a brown head best colors. If you're using four-pound line, throw a 3/32nd-ounce jig instead. We've had some requests for fly tying demonstrations, so Duane and I did a few this morning and posted them. Bait fishing, for whatever reason, has been slow -- not terrible -- but slow. Anglers have had to work to catch them off the dock, but there have been spurts where you'll have a bunch biting, and then the bites will slow down. Again, two-pound line will catch more fish, especially if you're fishing with a night crawler or Powerbait. Air-injected night crawlers have been the best though.